she had founded National Mill Dog Rescue. The non-profit organization has since rescued around 7,000 dogs of all shapes and sizes. Strader says that they accept all dogs, they don't "cherry pick" for the best ones. They are rehabilitated and cared for at the 160-acre facility by 1,400 loving volunteers and a small veterinary staff. In addition to rescuing the dogs and finding them loving "forever" homes, the organization also serves to educate the public on the cruel and toxic conditions in the commercial dog breeding industry, a.k.a. puppy mills. They encourage everyone to adopt their furry family members through respectable breeders, or preferably through shelters and rescue organizations. 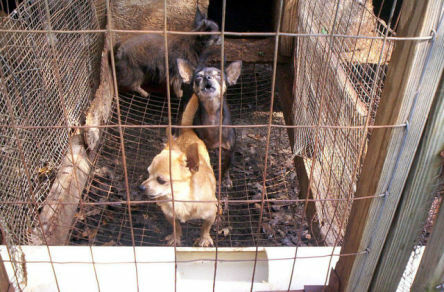 Dogs in these puppy mills have only one purpose in life -- to produce puppies for sale. They are kept confined in cages, are never exercised, never receive to veterinary care, are fed and watered poorly, never get to play or socialize, and never know the sun on their fur. The cages that they are kept in have wire mesh bottoms that cut into the pads of their paws. Most of all, these never know the love and care that all dogs deserve. The dogs saved by Strader and National Mill Dog Rescue end up adopted to good homes across the U.S. and are finally living the life that they ought to have had all along. Happy National Beer Day!!! The Animal Video Of The Day!! !